"#875" ["I stepped from Plank to Plank"] by Emily Dickinson. This poem is in the public domain. Art credit: "Hussaini Hanging Bridge, Pakistan," across the Hunza River in the village of Hussaini in northern Pakistan, photograph by Jonathan Blair/Corbis. 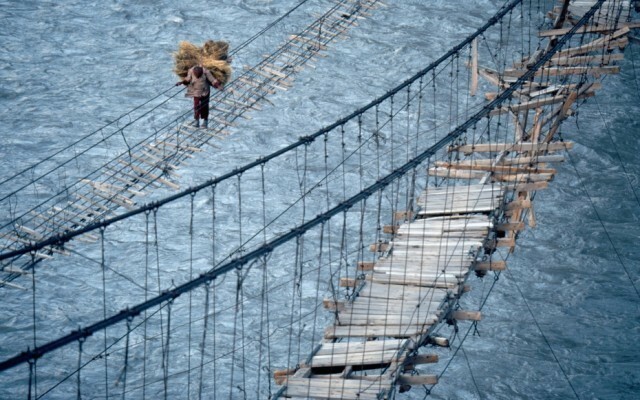 Caption: "Massive gaps between the planks, a wild side-to-side swing: there are reasons this is considered one of the world’s most harrowing suspension bridges. While rickety cable and wood bridges are common in this area, crossing this bridge over the rapidly flowing Hunza River is particularly frightening, as the tattered remains of the previous bridge hang by threads next to the one currently in use." And your comment taps the tuning fork in mine. Nice. Blessings to you in this season of celebrations, Rick!